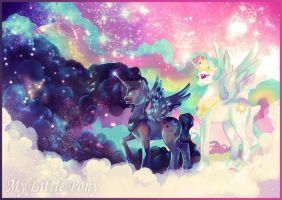 my little pony girls all colored! They look awesome. Well done. A few of them seem off, the clothing doesn't fit their personality. Fluttershy and Pinkie Pie lookin cute as always! You shouldn't self advertise bro. That's good to hear, but why exactly did you do it in the first place? But self advertising is not the way to do so. Most people would just see what you are doing as rude and a desperate cry for attention rather then giving you comments and favorites and what not. so what do you do to get viewers/fans? Just browse the newly uploaded deviations until you find one that catches your eye. Write a nice comment on their deviation and perhaps make it a little bit funny too. Of course it would be a bad idea to say "Aw this drawing is so cute! Feel free to browse my gallery as well ", because then you'd seem desperate and the person might think you are only writing that comment to self advertise. Also, browse the person's gallery, comment on their other deviations and eventually, a friendship might blossom, but you can't force it, like don't say 'wanna be friends?watch me I'll watch you back! ", ONLY watch the person if you genuinely like their personality and their art. And never ask them to watch you back or check out your gallery because they aren't obligated to do that if they don't want to. Basically, just be nice and social! Never expect things back and try to avoiding writing comments like "cool!" or "awesome!" because you aren't really saying WHY you think it's cool or what components of the drawing make it awesome. This is really close to how I imagine them as human! Very nice, but their poses are a little too exaggerated for the purpose of being dynamic. It's a little unsettling. I think the poses are perfect! Just shows their awesome and unique personalities! Pinkie seems a bit... odd? This is beautiful, captures the characters so well. Dash is so..perfect, right down to the shoes. Hmmm....Fluttershy looks almost too similar..
hmmm. because she's wearing a long skirt? I have to ask. Why is Twilight Sparkle always black? Just asking.